Amazing Girls – only on Amazon An Amazon exclusive! Discover the Amazing Girls play doll toys and join the fun! They’re a group of truly sweet and amazing girls who love style and adventure, but mostly they love being best friends forever. Ava, an Hispanic doll, is smart and kind, and loves learning about the earth. her friends call her Mother Nature! She stands 18” tall and is the perfect size for dressing and styling. With pretty brown eyes that open and close, wavy light brown hair, and an adorable smile, you’re sure to become best friends, too! Outfit includes a tee, jumper, knit scarf, and lace-up boots. Ages 6+ Explore the Adora Amazing Girls and join the fun! This fun new collection of 18” play dolls from award-winning Adora features five sweet girls - there’s Ava, Zoe, Emma, Harper, and Jada – each with her own unique style and personality and each sure to become your little girls new favorite friend. 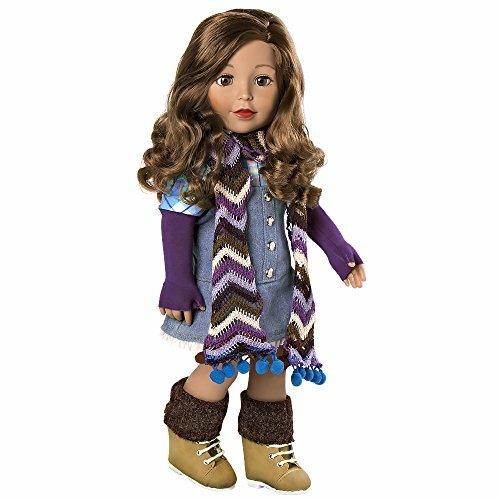 These play doll toys are the prefect size for styling and dressing, and come with inset eyes that open and close, long ready-to-style high quality rooted hair, and dressed in her favorite cute and trendy fashion. And with additional fashion outfits and accessories available, it’s a whole world of imaginative play for your very own Amazing Girl! Adora toys are thoughtfully crafted to give parents peace of mind. We are…Playful, Creative, Durable and most of all FUN! We hand craft toys that are as responsible as they are fun. This means our award-winning dolls are Hypoallergenic, Non Toxic, BPA Free, Safety Tested and Made with Love. Adora is a proud part of Charisma Brands LLC family based in California.